AUSTIN, TX -- Representatives from local, state and federal offices joined nurse practitioner leaders, staff and guests to celebrate the ground breaking for the American Association of Nurse Practitioners (AANP) national headquarters. 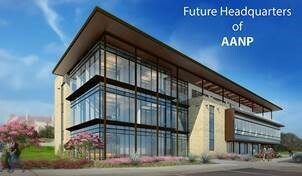 The building represents the continued commitment AANP has to the Austin community that has been home to the organization since its founding in 1985 and further solidifies Austin and Texas position on the map of Americas changing health care landscape. AANP Chief Executive Officer David Hebert, JD, kicked off the ceremony by introducing the many honored guests who were in attendance and talking about the positive impact that nurse practitioners have made on millions of patients throughout the nation. We are honored to have the many distinguished guests here today for this very auspicious occasion, said David Hebert. Nurse practitioners have experienced phenomenal growth since the inception of the role at the University of Colorado in 1965. In addition to being expert clinicians and diagnosticians, NPs also focus on health promotion, disease prevention, and health education and counseling, guiding patients to make smarter health and lifestyle choices. The faith that patients have in nurse practitioners is evidenced by the more than one billion patient visits made to NPs annually. On behalf of the AANP Board of Directors, I am pleased to welcome all of you to our groundbreaking event. NPs have been breaking ground in health care for more than 50 years, so this official groundbreaking for our national headquarters is all the more significant. AANP represents the interests of more than 234,000 NPs around the country, said AANP President Joyce Knestrick, PhD, APRN, CFNP, FAANP. This building will give us room to continue expanding services for our members and their patients. The new building, pictured below, will be located at 5901 Vega Avenue in southwest Austin, Travis County on a 4.199-acre tract of land. The three story building will be a 33,943 square foot professional office building that will be mostly owner-occupied by AANP. The first floor of the building will have space for tenants. The glass, stone and stucco building will have surface parking for 134 vehicles. For more information about AANP and nurse practitioners, visit aanp.org. To locate an NP in your area, go to npfinder.com. The American Association of Nurse Practitioners (AANP) is the largest professional membership organization for nurse practitioners (NPs) of all specialties. It represents the interests of the more than 234,000 licensed NPs in the U.S. AANP provides legislative leadership at the local, state and national levels, advancing health policy; promoting excellence in practice, education and research; and establishing standards that best serve NP patients and other health care consumers. As The Voice of the Nurse Practitioner, AANP represents the interests of NPs as providers of high-quality, cost-effective, comprehensive, patient-centered health care. To locate a nurse practitioner in your community, go to npfinder.com. For more information about NPs, visit aanp.org.